Ouafae Taame is a visual artist, 2D and 3D graphic designer, and digital print maker with two Degrees in Fine Art and Architecture from Morocco. She is inspired by the Islamic Art heritage and especially the western Islamic medieval geometric Art (Morocco and Andalusia).After the fine Art Institute in Morocco she worked as a senior environment artist and Art director in the video game company Ubisoft in Montreal Canada, Casablanca Morocco, Abu Dhabi UAE and Montpelier France, accumulating 12 years of experience in Video Games Graphic Design. 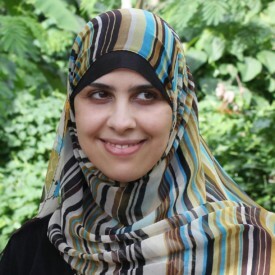 She was a key designer of famous video games such as Assassin’s Creed, Prince of Persia trilogy and Beyond Good and Evil etc.She is also the creator and owner of Wafa Islamic Arts, specialized in creating unique Islamic designs and wall arts. She loves to experiment with all traditional and digital mediums. She has participated in Art Exhibitions in Dubai, Morocco, and the United states.She has also led several workshops and Art classes for kids and adults in Washington DC, Maryland and Virginia, teaching Islamic arts, traditional fine arts subjects and Digital 2D/3D arts. Ouafae joines Tarbiyah Academy this year and is excited to share her rich background and love of the arts with students in order to open their minds and hearts to knowledge that is beyond the academic. Contact her at otaame [at] tarbiyahacademy [dot] org.